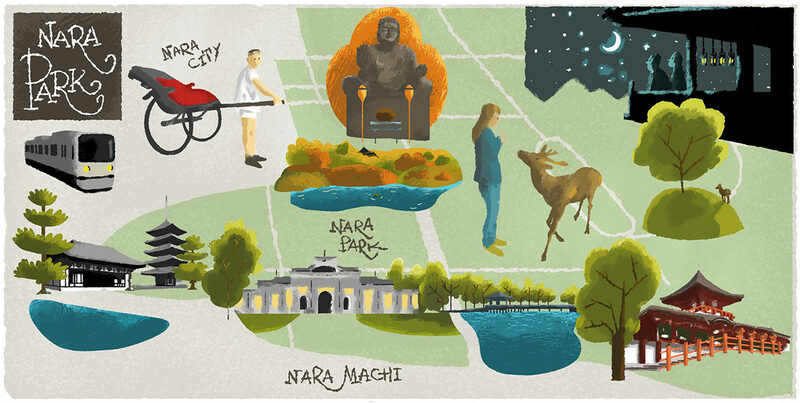 Alongside Naramachi and Nishinokyo, Nara Park is one of the must-see areas in Nara City. The vast area covers 660 hectares and is renowned for its free-roaming deer and world famous temples. Feeding the deer is an attraction in itself and special crackers are on sale all around the park. For human refreshments, there are traditional tea houses as well as kiosks selling snacks and souvenirs. Todaiji Temple with its 15m high Buddha is the most prestigious of Nara's seven great temples and draws a steady stream of visitors. Enter by passing through Nandaimon Gate to get a look at its two 8-meter tall guardian figures with Herculean physiques. Behind the temple, Nigatsudo has lovely views of the city. On the opposite side of the park from Todaiji, but connected by a pathway from Nigatsudo is Kasugataisha Shrine. The vermillion and white shrine buildings are festooned with beautiful brass lanterns, lit twice a year in winter and summer. The shrine is also famous for wisteria flowers that bloom in May. Towards Naramachi and away from the crowds, Isuien is a beautiful example of traditional garden design. It comprises a formal garden with stepping stones and a large strolling garden using the classical concept of borrowed scenery. The original villas and tea houses now offer meals. Designed for all seasons, the gardens are especially beautiful in autumn. Kohfukuji National Treasure Hall, a stone's throw from Isuien, is another key Nara Park venue, renowned for its collection of Buddhist carvings by master carvers like Unkei of the Kamakura period. Some of the priest figures are unnervingly realistic. The view from Sarusawa Pond across to Kohfukuji Temple’s pagoda is also a must-see. For more culture, check out Nara National Museum, which primarily displays Japanese Buddhist art. Even if pressed for time, the museum constructed in 1889 is worth a quick visit for a glimpse of its facade. Along with Nara Hotel, the museum's main building is a classic piece of Meiji period architecture. When in need of a break from sightseeing, and for unspoiled vistas over the city and its surrounds, walk one of the trails through Mt. Kasuga Primeval Forest, a sacred forest awarded World Heritage status. There are courses of various lengths but the best views are from the peak of Mt. Wakakusa. Certain sightseeing buses also include Mt. Wakakusa and lookout points along the scenic Nara Okuyama Driveway on their routes. The world’s largest bronze Buddha was completed in 752. Around 15m tall, it contains 130 kg of pure gold and X-rays have revealed more treasures inside. Behind it is a huge wooden column with a small hole which, if you can crawl through, is said to bring you enlightenment. Learn more about Todaiji and the Daibutsu. Almost 1200 wild deer roam Nara Park. Legend has it that a white deer carried a god from Ibaraki, in Japan’s north, down to Kasugataisha Shrine in a time when deer were considered sacred. Until 1637, killing one was punishable by death. Though no longer sacred, they are still protected. Deer are synonymous with Nara, and in particular Nara Park where they roam freely. They hold a place in local folklore dating back to the 8th century when they were known as “messengers of the gods.” Today they have come to symbolize Nara itself and deer-related merchandise is everywhere, including figurines, deer-leather goods, and deer branded items like pudding, towels, socks and more. The world famous Michelin Guide has confirmed that Nara is a foodie paradise, awarding its maximum three stars to Wa Yamamura. Hanagaki, Musoan and Onjaku received two stars. There are also 12 one-star restaurants and 15 Bib Gourmand, for affordable excellence. For fine dining near the park, try Onjaku or Ristorante I-Lunga. Nara Park offers breathtaking views and great snapshot moments with deer throughout the year. Attractions tend to be busy seven days a week, but regardless of when you visit, you can expect fewer crowds than Kyoto and a more leisurely sightseeing experience. Nara Park is best explored on foot, but taxis can come in handy when visiting attractions on opposite sides of the park; find them at one of the several stands located around the park's edges. Buses also serve several Nara Park venues and connect to other sites within the city. Deer in Nara Park are generally very docile and accustomed to people. That being said, they are used to being fed and will give encouraging nudges when hungry. To avoid too much unwanted attention, keep food items and leaflets (sometimes mistaken for food) under wrap when in the park. For a unique way to tour the park, look out for athletic rickshaw runners. They wear traditional attire and can be found waiting around the park. A rickshaw ride is a relaxing experience, especially during the hot summer months. Nara Park is a short walk east of Kintetsu-Nara Station. The area can also be reached by walking straight along Sanjo-dori Street from JR Nara Station, but takes roughly 20 minutes. Alternatively, hop on a bus. Nearly all city centre buses make stops in and around the park.